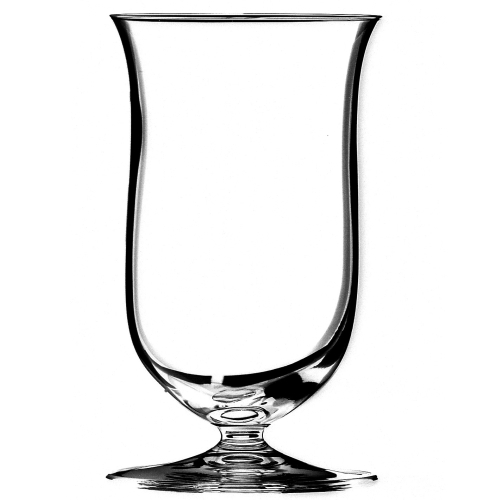 Sip in style with this Riedel Vinum glass. Exclusively based on the characteristics of reasonable price, quality and wide distribution, the Riedel Vinum series was introduced in 1986 and has since branched into the bar and spirits glasses for the ultimate home bar experience. These beautiful single malt whiskey glasses are the perfect way to enjoy your favorite aged whiskey, with its specially designed shape to enhance the flavor. Each piece is machine-blown of premium 24-percent lead crystal to combine the brilliance and clarity of fine crystal with a welcomed affordability that makes it perfect for everyday use. In early 1992, a panel of Scotch whiskey experts convened at Riedel's headquarters in Austria to test a range of nineteen different glass shapes. On the basis of this first selection, Georg Riedel undertook further research with the help of master distillers in Scotland. This research resulted in a glass that is an elongated thistle shape on a truncated stem. The design incorporates a small, slightly outturned lip which directs the spirit onto the tip of the tongue, where sweetness is perceived, and serves to emphasize the elegant creaminess of top quality single malt whisky.